Choked with car and truck traffic, the Manhattan Bridge ramps around Canal Street are a danger zone. DOT has a plan to tame some of the chaotic crossings for people on foot, which the Manhattan Community Board 3 transportation committee voted in favor of last night. Seven pedestrians and nine motor vehicle occupants were seriously injured at the intersection of Canal Street and the Bowery from 2009 to 2013, according to DOT, and one pedestrian was killed in 2009. The intersection has more serious crashes than 90 percent of Manhattan’s intersections, and residents have been calling for changes for years. Under DOT’s plan, the bridge’s lower roadway, which currently reverses direction to allow Brooklyn-bound traffic from 3 to 9 p.m., will become Manhattan-bound 24 hours a day. This frees up space to add a large painted curb extension that reduces crossing distances from 84 feet to 32 feet and ensures pedestrians on the east side of the intersection will cross no more than two traffic lanes at a time. 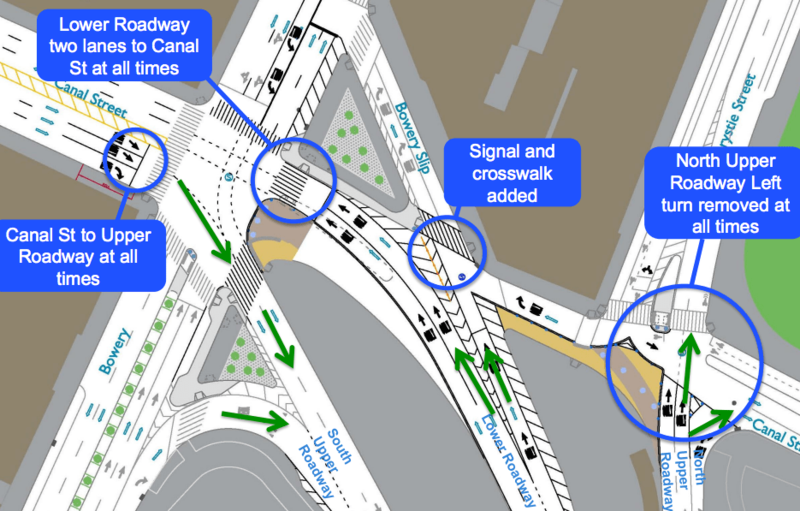 Triangle-shaped pedestrian islands to the north and south of Canal Street on the eastern side of the Bowery will also be enlarged, and the median on the Bowery south of the intersection, installed in 2010, will be extended to provide a refuge for crossing pedestrians. A range of other crosswalk markings and sidewalk extensions will tighten up intersections and give pedestrians shorter distances to cross the streets near the foot of the bridge. A resolution supporting the plan passed the committee, 6-0, and will be voted on at the next CB 3 full board meeting, scheduled for May 26 at 6:30 p.m. After the board signs off, DOT says it expects to begin making changes this summer, with final work completed by the fall. DOT is also proposing changes to the Brooklyn side of the Manhattan Bridge, which will be presented to the Brooklyn Community Board 2 transportation committee on Tuesday, May 19 at 6:00 p.m., 180 Remsen Street. Thursday, May 14, 12:45 p.m.: This post has been corrected. Previously, it erroneously stated that a left turn restriction would be added from the lower roadway to the Bowery. That turn restriction already exists. The bollards need to go. Shame that they’re not putting in a 2-way protected bike lane on Chrystie as part of this work. It’s long overdue. The first step in fixing decades of city policy making Chinatown a traffic sewer. Transportation justice. The curb extension & median island on the north crosswalk at Canal & Christie already exist. Now if only they’d do something about the cannonball death slalom that is the approach from the north down Chrystie via bicycle. Now if only there was a safe way to get there via bicycle. Wow. Something about great minds thinking alike. By soon, you mean in two and a half years. November 2011: Manhattan CB2 requests Hudson St protected lane. Based on that timeline, we can expect DOT to propose upgrades to Christie Street around August 2017. Will implementing this plan make it more difficult to install the requested two-way bike lane on the east side of Chrystie Street? It’s disheartening that bike accommodation isn’t improved in any way here. When exactly are they going to do something about Chrystie? There’s a huge error in the DOT’s presentation. They show there are currently markings for a bike lane on Chrystie. Why not make the lower roadway two-way instead of Manhattan-bound only? Doesn’t this plan just make it easier for trucks to use the bridge as a free shortcut to New Jersey? I thought they approved the 2 way bike lane on Chrystie. Not only does the street have no bike lane left (and it was crap when it was still there), but people cycling are forced to go way left in front of two lanes of cars at Houston right now.